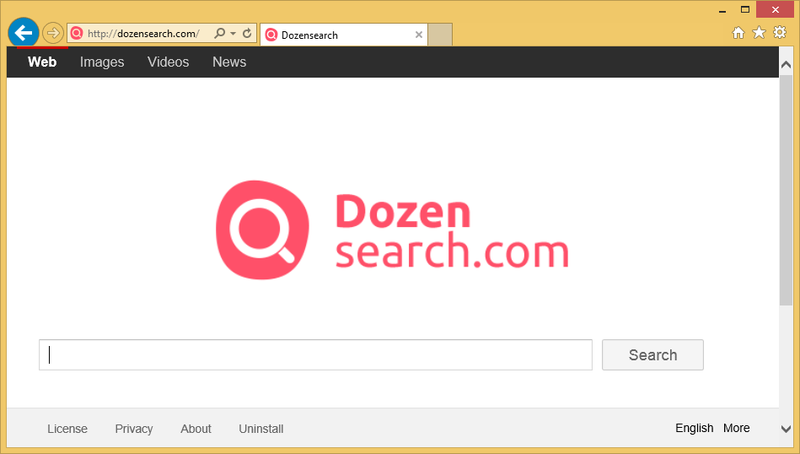 Dozen Search is another browser hijacker that belongs to the Websearch family. It does not differ from the other members of this family because it has a similar interface and it acts in the same manner as previously published hijackers. You will find out what it does the moment it enters your system. As Dozen Search is a typical browser hijacker, it will appear in the place of your regular homepage and search engine. It might also provide you with sponsored content. This content (ads and sponsored links in particular) might put your system at risk. Therefore, you have to delete Dozen Search as soon as possible. This will reduce the possibility of causing harm to your system or meeting malicious software. How does Dozen Search work? Dozen Search is definitely not unique in any sense because it acts like other browser hijackers. First of all, it changes homepages and search engines on Internet Explorer, Google Chrome, and Mozilla Firefox. Secondly, it tracks users’ activities and can even access cookies, browsing history, IP address, approximate location, and many other important details. It is very likely that it does that in order to be able to provide users with relevant advertisements and sponsored links. After a user clicks on a link or advertisement, he/she is redirected to another web page. This web page might be completely useless and even contain malicious software. Of course, users do not know about that at first. It simply means that they might cause harm to their computers in a short time. You can protect your system from malware. You just need to remove Dozen Search browser hijacker and set another homepage and search engine. If you find this difficult, continue reading the article as we are going to provide you with the instructions. How is Dozen Search browser hijacker distributed? Like other browser hijackers from the Websearch family, Dozen Search is distributed via software bundles. It does not travel alone in such a bundle. It has been observed that it travels together with various free applications, so it is not surprising that you see the presence of Dozen Search if you have tried to download some kind of free program. You should pay more attention to the installation process in the future as there is a possibility to deselect the unwanted programs and thus prevent them from entering the system. If you notice suspicious programs on your PC, erase them all after you successfully implement the Dozen Search removal. How to uninstall Dozen Search browser hijacker from my computer? If your system is infected with Dozen Search browser hijacker, you have to delete Dozen Search as soon as you can from your browsers. If you find it difficult to solve this issue yourself, you can remove Dozen Search browser hijacker automatically. Just acquire a reputable tool Wipersoft and scan your system. If you feel experienced enough to implement the manual Dozen Search removal yourself, we still suggest using our instructions which are placed below this article because the deletion process is not very easy. You have to check your system and eliminate other unwanted programs too because they might download and install a browser hijacker once again.